Among the various plasticizers that may be employed in the PAN melting process, are glycerin and its derivatives, such as glyceryl stearates, glyceryl phosphate and glyceryl carbonate, and others. This means use of cheap raw materials and low environmental and occupational risk, making the fiber production process simpler and cleaner. Low-priced glycerin availability of is a worldwide trend and is expected to expand due to the use of biodiesel to replace fossil fuels. 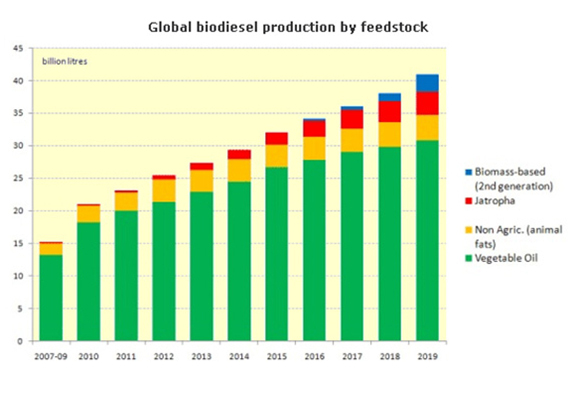 Since the 1990s, biodiesel has been singled out as a viable alternative for environmental, economic and strategic reasons to guarantee countries the independence of fossil fuels as the oil availability depletes. Glycerin or glycerol, chemically 1,2,3-propanetriol, is a byproduct formed during the production of biodiesel in the proportion of 10%, which production is increasing on the planet due to the increased production of biodiesel. 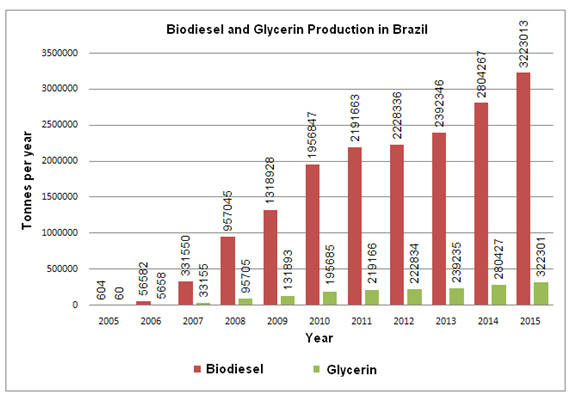 The biodiesel market in Brazil was 4 million m3 / year or 3.2 million tons / year in 2015, which is equivalent to an excess of 300 thousand tons / year of glycerin in the market and around 3 million Tons / year in the world. The price of glycerin has been dropping each year, leading crude glycerin with 80% content to reach a cost of less than US$ 0.20 / kg. Glycerin corresponds to 10% of biodiesel production. Due to this availability of glycerin on the market at a very low price it is very advantageous to use it in PAN plasticization. Therefore, it is a focus of IGTPAN research, the development of copolymers that allow to be plasticized with this glycol or its derivatives, producing THERMPAN resins that can be transformed into fibers or any other type of product. The viability of the use of glycerol has already been proven in several resins that were produced with some copolymers synthesized and that presented excellent melt spinning rheologies. Another great advantage of employing glycerin in PAN plasticization is because it is very soluble in water, it can be easily removed from the fibers by washing, restoring the fibers to the same composition as the original copolymer, as if they were produced by wet or dry spinning. This way these fibers are suitable for producing carbon fiber.